Ute or a Service Body? Regardless if you’re a contractor, mechanic, plumber or electrician, these trades all have one thing in common: they require a work vehicle for the job and in most cases it is a work truck. Work trucks can be spotted all over, from country gravel roads to city streets. A work truck can be as simple as purchasing a ute from a local dealer, applying some company decals and putting it to work. A work truck can also be as complex as purchasing a truck from a dealer and having a service body customized to your application. Where do you fall on the spectrum? Does your job require the simplistic, bare bones approach of a simple ute or is a well-equipped service body a better choice? Below is a series of questions which will help guide you to the product that best fits your needs. So, when your next work truck purchase comes around, use these questions to help make your decision a little easier. Do you need to get every square inch out of your work truck to store tools and equipment? Do you commonly find yourself storing tools or parts in the cab? Do you need to keep your tools and equipment locked up and safe from inclement weather? A standard ute is great for hauling larger items that fit in the tray. However, when it comes to securely storing tools and equipment a ute just isn’t designed for the application. So, many turn to side mounted toolboxes for storage. Toolboxes are great for creating secure storage in the bed, but offer limited space and require users to reach high and low to find their tools. 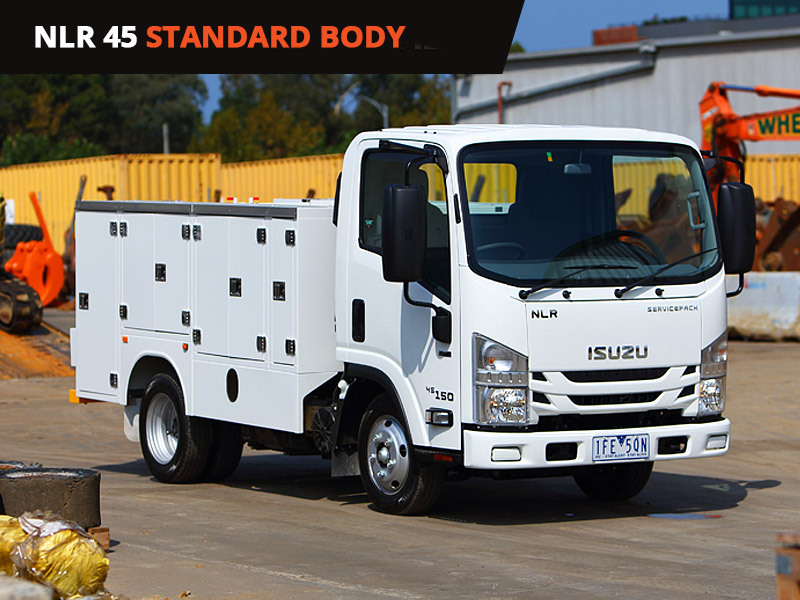 Service bodies such as the CITYPRO NLR 45 STANDARD utilize the sides of the trucks bed space with integrated compartments in front of and behind the rear axle along with one directly above. Since the compartments are integrated on the sides of the body, users maintain the open cargo space for oversized items. The compartments enable users to keep their tools, parts and equipment secure and out of inclement weather. Do you spend a lot of time digging through your tools to find what you need? Are you getting frustrated climbing in and out of the truck bed every time to access what you need? A service body offers a series of compartments with shelving so all of your contents have dedicated storage space, also known as “forced organization”. The user knows exactly where that 3/8” socket is and doesn’t waste 15 minutes searching for it on the truck. Service bodies offer quick accessibility. The user can pull up to the jobsite, jump out of the cab and quickly retrieve the tools and parts from the side compartments and get to the tasks at hand. Company decals applied to your work truck speak to anyone and everyone around as a rolling billboard. Like it or not, your branded company vehicle is a representative of your company. A messy, disorganized work truck, whether sitting on a jobsite or in transit between jobs, does not convey professionalism. Imagine you had plumbing issues in your house, called a local plumber for service and a cluttered work truck shows up in your driveway a short time later. Like many people you grow concerned about the quality of service based solely on that first impression. The plumber may be the most competent in the area but the work truck does not match the quality of service, resulting in a jaded first impression. In contrast, a service truck such as the CITYPRO NLR 45 STANDARD with ample storage space (think no cluttered bed space) and clean customer decals will provide a great first impression to anyone that sees it. Utilizing the compartment storage for organization and abundant space on the sides of the service body for company graphics helps companies achieve that professional look and positive first impression. Your company’s image is important so give a positive first impression with your work trucks.